Bell Helicopters was the winner of a 1963 United States Air Force competition for a support helicopter for use on its missile bases. Bell had proposed the UH-1B for the competition but the USAF asked Bell to develop a special version of the "Bravo" in using the General Electric T58 turboshaft as a powerplant. The USAF already had a large inventory of these engines for its fleet of Sikorsky HH-3 Jolly Green Giant rescue helicopters and wanted to have commonality between the types. This engine was capable of 1,250 hp (932 kW) compared to the UH-1B's 1,100 hp (820 kW) T53-L11. In response Bell proposed an upgraded version of the UH-1B with the T58 engine installed. 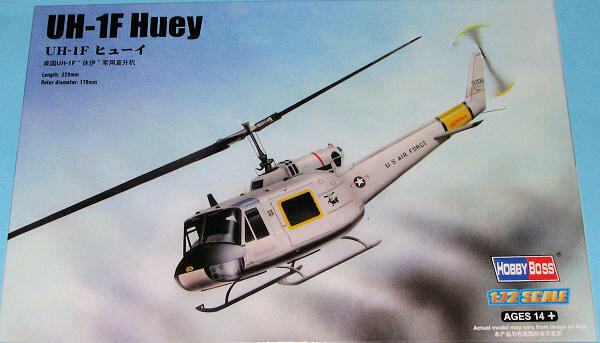 The resulting UH-1F had the shorter cabin of the "Bravo" Huey, but with the longer tail boom, rotor and transmission of the UH-1D. Due to the Huey's configuration, Bell installed the T58 engine backwards compared to the HH-3. The Huey's engine is behind the transmission, whereas the HH-3's engines are in front of the transmission. Externally, the only visible differences from UH-1B were the engine exhaust, which exited to the right side of the engine and the longer tail boom. The UH-1F was introduced into the USAF inventory on 20 February 1964. The USAF took delivery of 119 with production ending in 1967. Many of the aircraft served in southeast Asia with the 20th Special Operations Squadron and some were converted to the armed UH-1P configuration. In Italy, Agusta produced a similar model by re-engining the 204B with the 1,225 hp (914 kW) Rolls-Royce Gnome (license-built T58) turboshaft, but later models used T58s. The AB204B was exported to the military of the Netherlands, Denmark, Austria, and Switzerland. It had a rescue hoist located at the right side of the cabin. 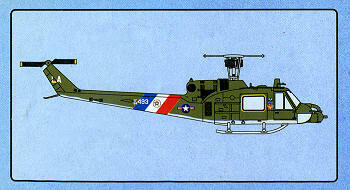 The last UH-1F was retired from the USAF in the early 1980s when it was replaced by the UH-1N. many of these aircraft later served as forest fire fighting aircraft with various US state governments and agencies. There was a TH-1F trainer also built for the USAF. The first TH-1F was flown in January 1967 and deliveries ran from April to July of that year with 27 completed. Molded in five sprues with one clear, this is the first time I think that this variant of the Huey has been kitted. 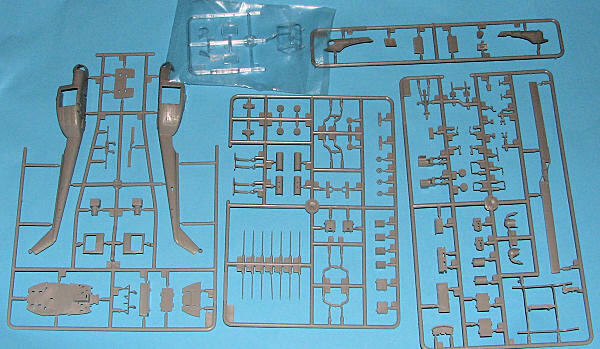 The molding is very well done as we have come to expect from Hobby Boss. There is a full interior that includes the armored seats and there is a collective control in addition to the cyclic. There is good detailing the cabin and one has a variety of options that include ammo drums or seats depending on whether or not you wish your aircraft armed or not. For armament there are a goodly selection of rocket pods or machine guns than can be added. Of course, if one is doing the strictly SAR version, you won't be putting any of those on the model. The fuselage does include the grooves on the lower side into which one will put the braces for the weapons pylons. Another armament option is a nose mounted grenade launcher so you can have a pretty heavily armed helo if you wish. There are separate cabin doors, though the instructions shown them as being closed. The clear sprue is very well done so one will be able to see the work done on the interior. Building instructions are well done with color information using Gunze paints. There will need to be holes drilled for some of the options and those are clearly shown. 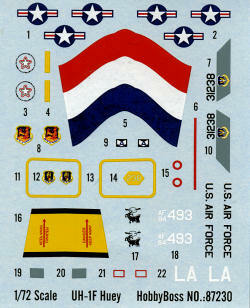 The full color painting and decal guide offers two versions. One is the box art aircraft in overall ADC grey as flown bythe 37 ARRS at Ellsworth AFB in 1973.The other is in Olive Drab over Grey camouflage and was the bicentennial plane from the 58TTW at Luke AFB in 1976. Decals are well printed and quite colorful. Always glad to see a new version of an aircraft kitted. This one has been on the wants list of many helo fans and I'm sure it will build into a beauty.